We drove south at a leisurely pace to a remote coastal haven Peaceful Bay, our next destination. It was a welcome relief to know the long hours of driving were behind us. Over the next five weeks we would drive shorter distances as we explored the beautiful south-west coastline of Western Australia. Leaving Pemberton we joined the South Western Highway and travelled south through forest and native landscapes. We passed through the small town of Walpole, which nestles beside the picturesque Walpole Inlet and is surrounded by the Walpole-Nornalup National Park. We crossed over the Nornalup Inlet, drove through the town of Nornalup and took the turn off to Peaceful Bay. Ten nights camping followed in the Peaceful Bay Caravan Park, hidden away on the pristine sheltered waters of Peaceful Bay. This would be our base to adventure into the surrounding region over the coming days. The campsites were a good size, nicely weaved throughout the bushland and well spaced apart on green grass. We were many hours from city life with patchy phone reception, making it quite a retreat. On our first morning in this new place we hooked up our boat and drove to Nornalup Inlet for a gorgeous day on the water. The banks of the inlet were lined with lush native grasses and majestic karri trees making for a serene and beautiful waterway. The adventurer braved a jump into the murky waters for a swim, reporting back that it was icy cold. We had heard that fishing was popular on these waters but we caught nothing that day, maybe the adventurer scared them off with his daring dip. On the next day we took a trip to Denmark, a gorgeous town about forty minutes drive east from Peaceful Bay. 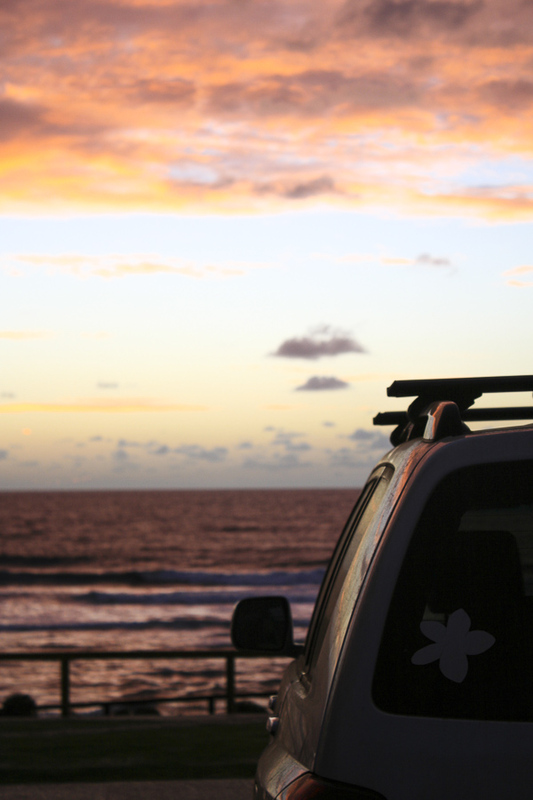 We discovered Ocean Beach and my surfboard finally came off the roof racks for a couple of idyllic waves. This was one of the few patrolled beaches we had seen on our travels, offering a surf school and a kiosk open over the summer months. It was a crowd-pleasing spot to swim and surf, we settled in and spent the whole day there. Later that afternoon we took a detour down a roughly graded, dusty dirt road towards Lights Beach. I had read that Lights Beach was a great spot for catching bream fish, something Mr G loves, and fortunately we had nowhere else we needed to be. This was the greatest joy of our road trip adventure, the delight of no fixed schedule. I found a warm spot in the afternoon sun to read my book and Mr G went fishing. Within a few minutes of getting myself settled I heard laughter and Mr G calling my name to come and see the bream he had snared. If only I could bottle the joy on Mr G's face as he kept reeling them in throughout the afternoon and evening. The sun sank slowly on the horizon, eventually disappearing and leaving behind a magnificent apricot glow. Distracted by an abundance of bream and a breathtaking show of colour over the ocean and sky, it was suddenly dark and we scrambled around to gather our things and clambered back up to the car park around nine o’clock. Mr G would have liked to stay longer but a bag of eight bream was more than enough and like distracted children, we giggled about our fishing fortune as we drove back to our campsite. Later that week we had another boat trip, this time on the Irwin Inlet not far from Peaceful Bay. We spent the day exploring the inlet and happened-upon where the water narrowed, exposing vast sand flats before flowing out into the ocean. We anchored our boat on the edge of the sand and wandered the sandy shores, swimming in the warmth of the shallows. Across the inlet there was a collection of people with 4WD vehicles set up for the day on the water’s edge. This spot could only be accessed by boat from the mouth of the inlet or by 4WD across the sand dunes of Peaceful Bay, making it exclusively remote and exquisitely untouched by many. Our days at Peaceful Bay were wonderfully slow, and each night as the temperature cooled we enjoyed the warmth of a wood fire, a simple meal and the comfort of a good book at our campsite. After ten relaxing days we packed up camp at Peaceful Bay and made our way back up the west coast for a couple of hours to the Margaret River township. Here we were reunited with all our children, the law student and the design student joined the adventurer to spend two weeks with us on the west coast. We collected them from the bus stop in town, picked up some groceries and then drove a scenic fifteen minutes south to Gnarabup where we had hired a comfortable beach house for two weeks of family holiday. Wonderful days together with trips as far south as Augusta and the very bottom tip of the west coast, where we admired the picture perfect Cape Leeuwin Lighthouse. We sat on huge rocks in the afternoon sunshine watching the southern ocean pound the rugged coastline, and sighted rock crabs coming, going and sunning themselves in between. This stretch of coastline from Cape Leeuwin to Cape Naturaliste is beyond beautiful and there are so many hidden treasures to discover along the way. Hamelin Bay with its pure white sand and dazzling deep blue water is also the home to giant stingrays who grace the water’s edge daily to be admired and even stroked by human hands. The majesty and sheer size of these sea creatures is quite overwhelming. We were unperturbed by signs warning us of shark sightings, apparently a tiger shark had been spotted over the past week in Hamelin Bay. Gracetown, a small settlement located half way down the Cape-to-Cape coast in the heart of the Margaret River region, sits above the still waters of Cowaramup Bay. The houses here are a mix of old fibro beach shacks from the 1960’s and a few more contemporary houses built to take in sweeping ocean views. There is a solitary general store by the beach that services the town and a protected boat ramp in the bay, making it the perfect spot for Mr G to put the boat in for some fishing. Caves Road runs along the coast and every few minutes on the roadside you’ll spot another winery, brewery, cidery, olive grove, cheese or chocolate maker, it certainly is a food and wine lovers paradise. We spent a couple of days exploring Yallingup, Cape Naturaliste and Dunsborough region; visiting Canal Rocks, Smiths Beach, Bunkers Bay and enjoying a cooling swim at pristine Meelup Beach. We had a fun day trip to Busselton Jetty, walking along the longest jetty in the southern hemisphere, which stretches nearly 2km out to sea from the town of Busselton. 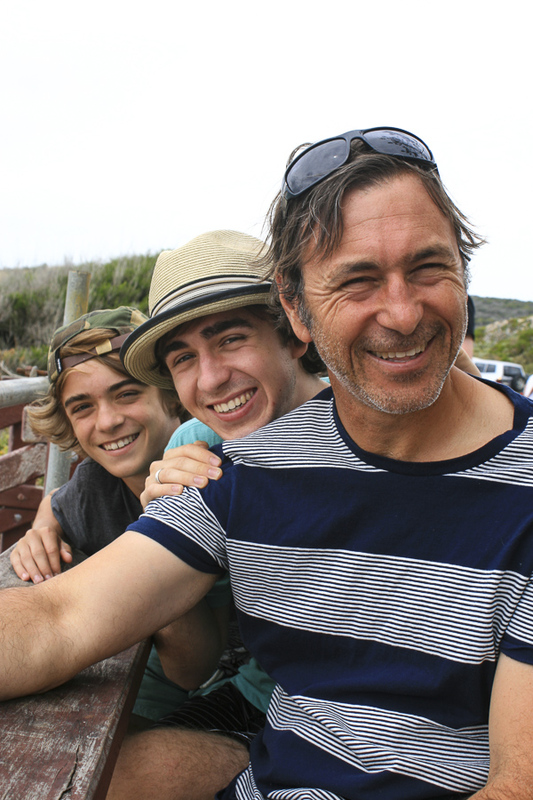 After a memorable two weeks together, the law student had to return back home to Sydney and the four us set off back down the coast, south towards Denmark, Albany and Esperance. As we passed again through Walpole, the adventurer wanted a haircut. We found a suitable place, The Big Hair Shop with colourful hairdresser and shop owner Ivan on the scissors that day. While we went to grab groceries up the road, the adventurer chatted with Ivan about our big adventure and my first cookbook. As it turned out Ivan was quite a foodie himself, and he suggested we swap the haircut for a signed copy of my cookbook, green beans from his garden and half a dozen lamb shanks from his freezer. Deal. Eager to show our design student the beauty of the Denmark region, we camped three nights at the Denmark Rivermouth Caravan Park, situated right where the Denmark River flows into the beautiful Wilson’s Inlet. Boating, fishing, crabbing and eating dinner by the rivers’ edge in the company of kangaroos were all part of the charm of this place. We spent one afternoon at Greens Pool, a large sheltered rock pool with crystal clear waters then wandered around the headland to see the iconic Elephant Rocks, a collection of large elephant-shaped boulders that rest in the shallow waters of a small cove. Exploring them was magnificent. Meanwhile, Mr G threw a fishing line in off the rock platform and caught a couple of late afternoon whiting. Departing Denmark the next morning we continued back east to Albany a port city, the oldest permanently settled town in Western Australia, and the place where the ANZAC troops departed for Gallipoli, it is a town of history and heritage and quite a windy place! We camped just a stone’s throw from Emu Point and Middleton Bay, and managed to find some gorgeous sheltered swimming spots to enjoy. We drove out to Two Peoples Bay Nature Reserve, here we discovered some of the most stunning beaches on our trip so far. The bay itself, Little Beach and Waterfall Beach all took our breath away. Walking down bush-lined sandy tracks towards the waters edge, suddenly we would encounter stunning Mediterranean colours and the pristine solitude of these hidden coves and beaches. As much as I want to promote these parts of Australia as somewhere worth visiting, I am quietly thankful that its inaccessibility will keep it untouched by those whose holidays don’t go beyond a short plane ride and a week in a resort pool. The Albany Farmers market kept us well fed the few days we stayed there. Plump sweet raspberries, fresh eggs, local olive oil, lamb from the farmer and an abundance of summer vegetables were a welcome sight. We filled our stores in anticipation of our next remote destination, Bremer Bay, where we knew supplies were quite sparse. 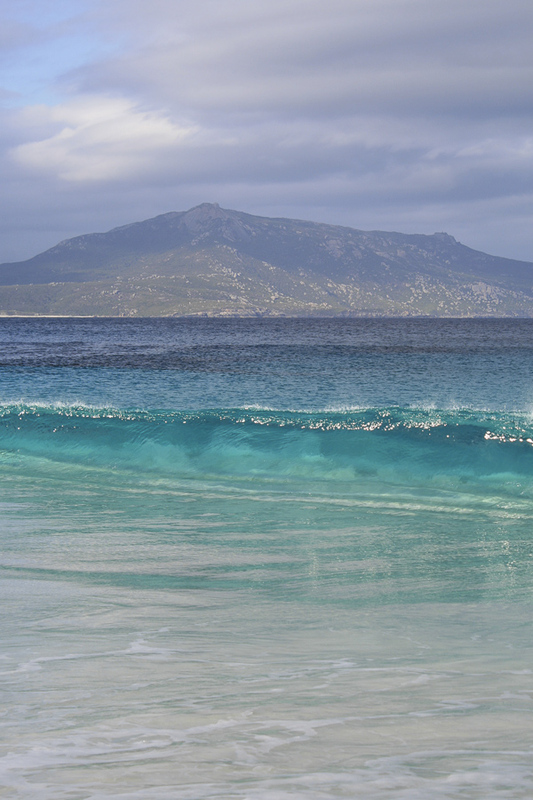 Bremer Bay is a coastal town at the mouth of the Bremer River, situated on the south coast of Western Australia in the Great Southern region between Albany and Esperance. It is a half hour detour off the South Coast Highway towards the bottom of the coast. We camped there in the caravan park for a couple of nights, only wandering distance from the beach. 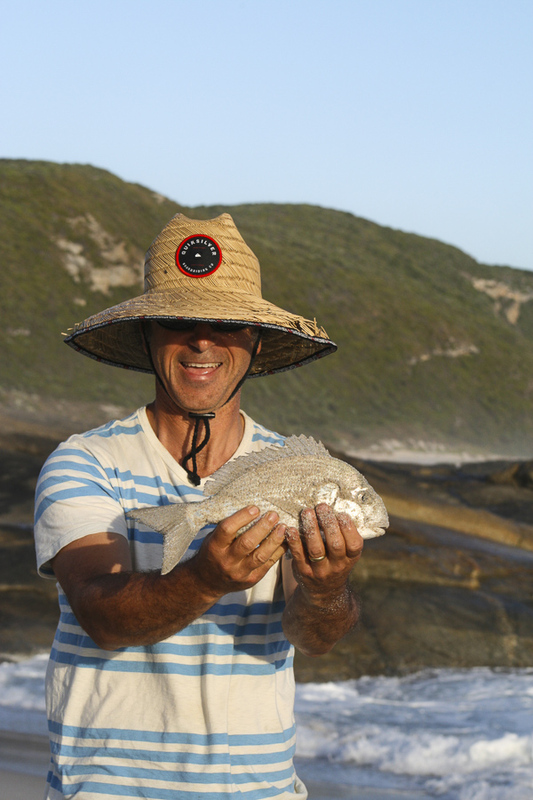 There really isn’t much at Bremer Bay but unspoilt coastline, great fishing opportunities and peace and quiet. It has one very basic general store, a couple of local businesses open when they feel inclined, and two fuel stations. We had now been travelling for eight weeks on our adventure and our pace had significantly slowed. There were moments in the days at Bremer Bay where we really didn’t want to think about returning home to the city pace. It’s a place like no other to unwind. We swam in azure waters, slept late and explored the splendid beauty that surrounded us and Mr G even caught some more bream. I managed to cook the lamb shanks (scored from the hairdresser in Walpole) in our camp oven over the open fire. This attracted quite a few onlookers from neighbouring campsites, fascinated by my passion to try such a culinary project in the great outdoors whilst on holidays. Why not? I had all the time in the world for slow cooking on this delicious adventure. 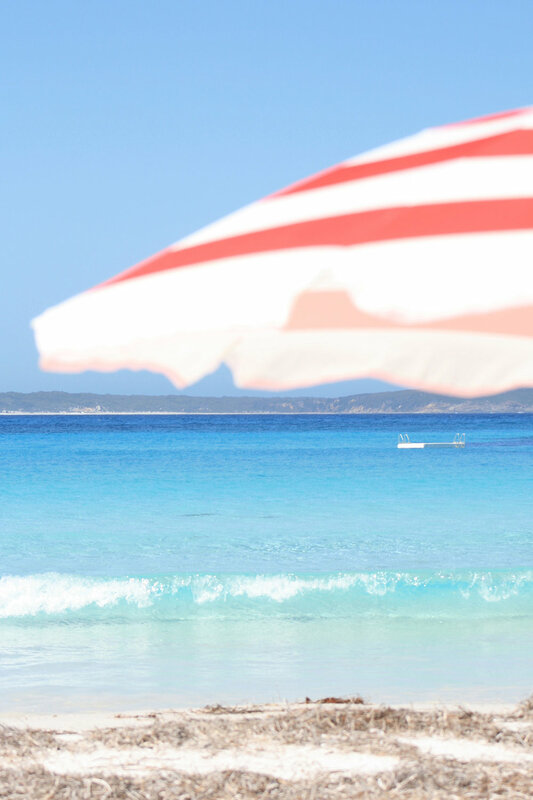 Our final place to camp before we left Western Australia was Esperance, a sprawling coastal town with plenty of shopping centres, accommodation and dining options on offer. However, the real gem of this region turned out to be the Cape Le Grande National Park located about 50km east of Esperance. We took a day trip there, travelling by sealed road, and were grateful we did as we encountered beautiful beaches and bays set between rocky headlands and an impressive chain of peaks including Mt Le Grande, Frenchman Peak and Mississippi Hill. Lucky Bay, known as Australia’s whitest sand beach, is set against the stunning seascape of the one hundred and ten islands of the Recherche Archipelago. There are a couple of camping options within the National Park. 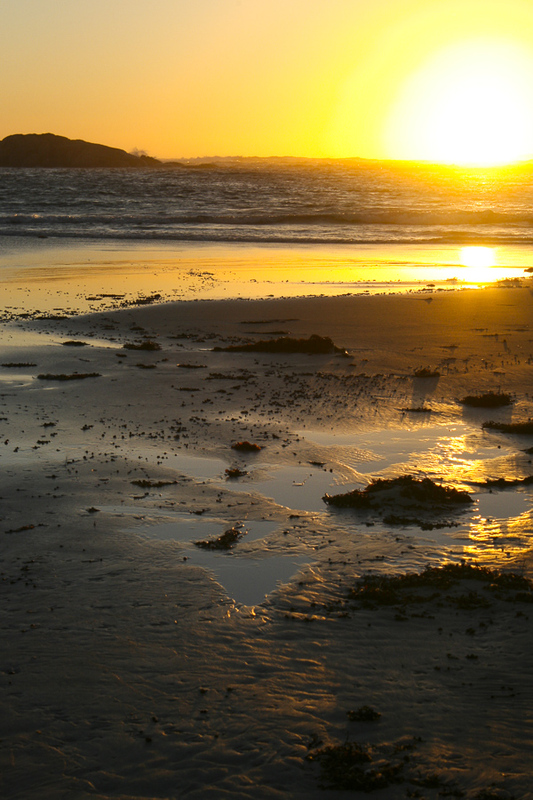 At Lucky Bay there are unpowered sites with solar hot showers, a camp kitchen and barbeques and resident kangaroos quite tame to human touch. We braved the steep climb of Frenchman Peak on our way back out of the park, and enjoyed unsurpassed views of the surrounding coastline and islands, this place was a beach and nature-lovers paradise. Our days of exploring the stunning south-west were over and we returned to Esperance to pack up and begin the long journey back east and eventually home.